Get Involved In Preparation for National Sunglasses Day 2019! Sunglass companies – Visit the “2019 Materials” page to check out print, online and social media marketing collateral pieces to bolster your sunglass sales. Consumers – Practice sun-safe behavior by wearing your sunglasses throughout the year, as the sun’s UV rays are always at play. And by National Sunglasses Day, wearing them will be a regular habit. On June 27, don’t forget to celebrate #NationalSunglassesDay by posting a #SunglassSelfie in your favorite sunnies to social media. 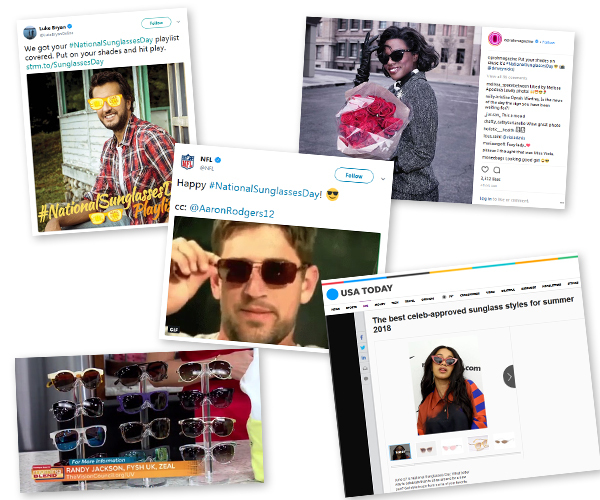 Media – Add National Sunglasses Day to your editorial calendar, so you can share the message through your outlet and on your social media networks tagging #NationalSunglassesDay. Questions and inquiries for more information can be directed to Maureen Beddis, The Vision Council’s vice president of marketing and communications. Media inquiries can be directed to Kelly Barry of BWR Public Relations.